Tucked away in a quiet neighborhood in Northeastern Pennsylvania are several perfect examples of salvaged materials being given new life. The owners of this house frequented our warehouse finding multiple items to revive, giving ultimate character to their home. 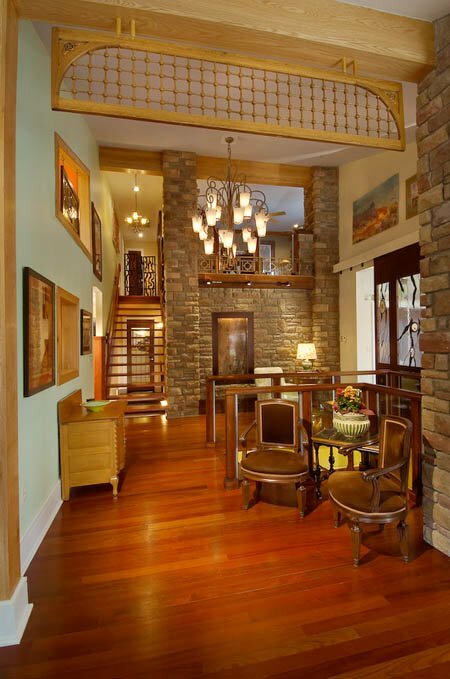 This shows that reclaimed architecture can be very beautiful as well as rewarding when used in the proper setting. 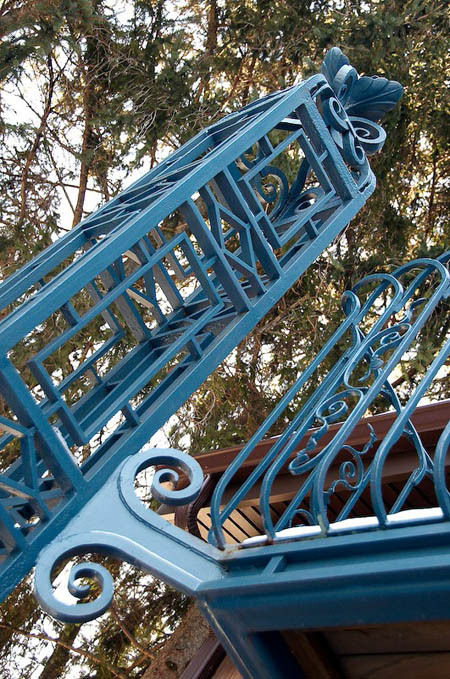 Pieces of brass or iron railing can be reused for their original purpose, or as accent accent pieces or focal points to a living space. 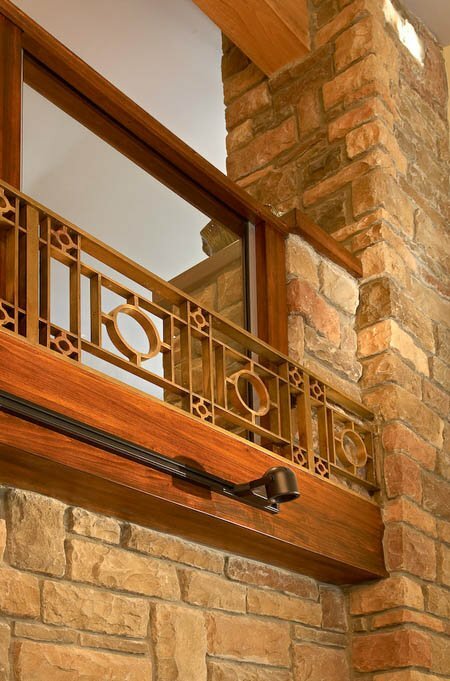 Our homeowners did this with some brass work that they used in front of a glass and wood railing. It complements the neutral tones of the room, and adds a contrast in texture as well. Continuing the theme outside the house can bring unity to the site. 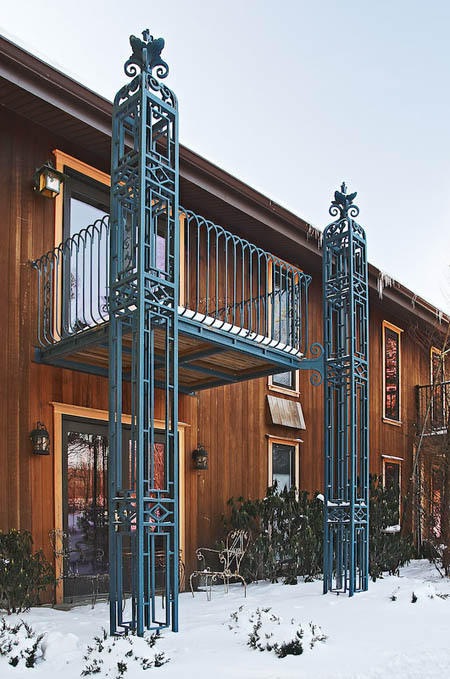 Our homeowners did this here, creating a “Juliet balcony” with iron columns as supports that were found in our iron yard. This adds an interesting and unique focal point to the exterior, and provides a private place to enjoy the morning sun and get some fresh air. Aside from the balconies, our homeowners also have a love for stained glass windows. Salvaged stained glass can be used in many different ways. They can be hung in a window as a removable decoration, or they can be installed permanently as a privacy window in a bathroom. 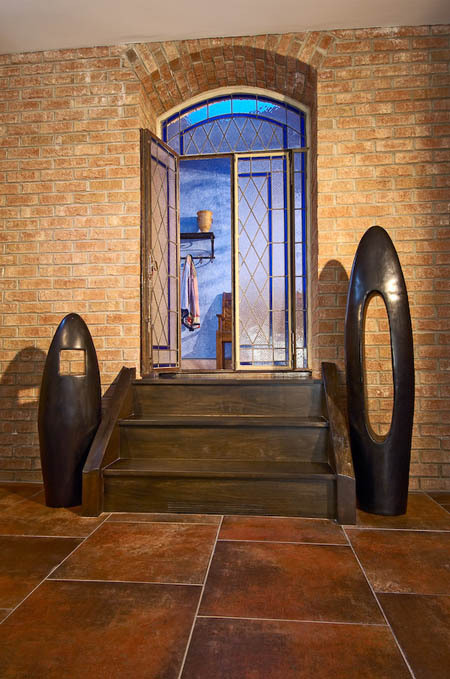 This couple used the pieces to create an entrance from their cellar that is very modern and inviting. The cool hues in the glass contrast the warmth of the brick tile and draw attention making this the focal point of the room, and encouraging visitors toexperience the rest of the house. Any item can be a treasure when placed in the appropriate setting. Olde things can be used in new ways and, as we’ve seen here, with remarkable outcomes that can add character and charm to any space. Consider renewing, reusing, and recreating.